Northern Ireland will take on South Korea for the first time in a friendly at Windsor Park on 24 March. The game is a warm-up for the Koreans as they prepare to take part in the World Cup in Russia this summer. 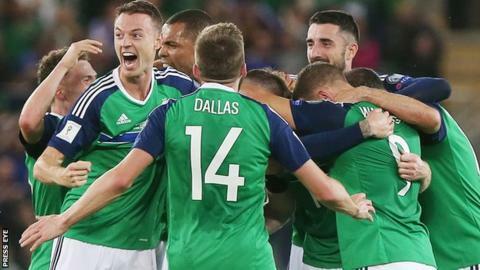 "They have a big squad so I've no doubt their players will be out to impress their manager with the World Cup looming," said NI boss Michael O'Neill. "The game provides our players with an opportunity to go up against a country we have not faced before." He added: "It's also an opportunity to see how they handle opposition from outside Europe." Northern Ireland fans will hope that O'Neill is still in charge for the friendly. The Scottish FA is set to hold talks with the 48-year-old with a view to him becoming the new Scotland manager. The South Koreans, known as The Reds, reached their ninth consecutive World Cup tournament after navigating three rounds of qualifying in the Asian Football Confederation. Shin Tae-yong's side are also fresh from winning the E-1, the football championship of East Asia, which was held in Japan last month. The Reds, who are currently 60th in the Fifa World Rankings compared to Northern Ireland in 24th position, have been drawn in Group F in Russia where they will face world champions Germany, Sweden and Mexico. The star of the South Korea side is Tottenham Hotspur striker Son Heung-min, who has scored 20 goals in 61 appearances for his country. Irish Premiership fixtures scheduled for Saturday, 24 March will now be played a day earlier and all with a 19:45 GMT kick-off.